Brilliant! Marcus and Abby just had their little girl, Selah. Congrats to you two. Selah apparently means "to ponder" or "to wonder". Ah. For more details, check out Doug's blog. I tend to think in extreme micro and macro sometimes, forgetting that which is in between...real life, real people, and seasons of transition. I have commented before that I love the transitional seasons (fall and spring), but seasons in my own life are difficult to live into sometimes. I have a feeling that when we all lived closer to the soil, saw the earth produce blossoms in spring, food in fall, we could value each season for what it was. Most of us now would prefer the Southern California year-long-summer or at least we'll stay away from the Minneapolis winters. But these seasons are valuable, whether they're delightful and sunny or dark and cold. The earth must reset itself and so must we as well. People continually remind me that this phase with a newborn is but a season...and by the time that you're nearing its end, you'll wish that you had cherished it more. But in the middle of this season, I sometimes want out, you know? I want to hurry the season along. When we moved to SF, I wanted to immediately know the city. I wanted to know and be known by all the neighbors; I wanted to know the unfound hotspots; I wanted to feel like we'd lived here for years. I wanted the season of "learning new things" to end so the next could begin. I have said before that I don't value the process as much as I'd like to. I like arrival points (however fictitous they may be). And I tend to want to rush towards these points, to end the season early, to skip ahead. I know, I know...it's lazy and it robs me of real growth. True dat. Every season must have significance to our lives and to the world at large. I gotta believe that. And so begins the Lenten season tomorrow. I have decided (and so has Holly) to give up coffee for Lent. A good friend of ours thinks I'm an addict. I say it's merely a coping mechanism for early parenthood. Still, we're going off the goods for this season. I constantly remind myself that categories aren't real. That is, they aren't Reality. Categories help us label and understand our world, our universe. They can be very useful for creating equations (whether economic, social, scientific, political, spiritual, etc. ), but we must remember that categories are tools to help us understand our world. They are tools. They are not to be confused with the World or Universe. Categories do not exist in Reality. We have created them. I often label myself and others. And sometimes we'd prefer to label and be labled. It gives us a comfort of how things are. But it's not how Things Actually Are. They're mental or social shorthand that point beyond. Categories act as symbols with hard lines so that we can understand and set up expectations. I heard a Sufi Mystic speak about how they look for the essence of religions, not the language used to describe the essence (categories). She commented that the lines begin to blur when we loose our categories to touch the infinite. I found this very helpful. Okay, sure this can sound all ethereal and meaningless, but we allow ourselves to be trapped into categories, not even realizing that the categories are made-up. 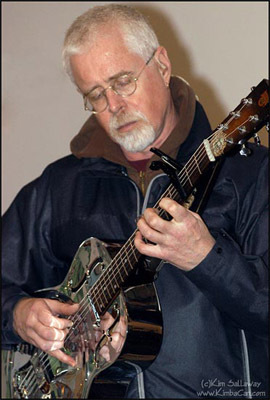 I say I am a musician and I immediately feel like I'm not writing enough music or that my music is too pedestrian. But then I remind myself that I am also a communicator...but then I'm not speaking clearly enough with my songs. But I am also a fellow traveler and teacher and listener and prophet and friend. Which rules do I follow first? And it gets further complicated when we use categories in groups/communities. Few people toe the party line for any one group. So what use is a category (like a "church" or "religion" or "genre") if there is huge diversity of opinion that is not represented in the culturally-accepted understanding of the category. These categories are helpful in understanding who we are as individuals and communities, but they are not Real, you know? Hey yo. 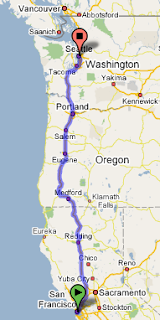 So, we're planning on doing a 10-14-day tour/trip up to Seattle and back in late April / early May. We are hoping to play some house shows along the way there and back. We already have about a half-dozen lined up, but would love to set up some more. We'll be between northern CA, OR, and WA for 10-14 days somewhere between April 20th and May 7th. Would you be interested in hosting a show? Or do you know someone who would? We have nearly zero contacts in Oregon and southern Washington. Do you have any connections? Not so much looking for coffee houses or clubs for this go around...just simple living rooms. This will be our first tour of the new album (scheduled to release just before the trip). I'm hoping that these concerts will be even more interactive than the last tour. I am hoping that we can raise some questions, weap, mourn, celebrate, and imagine together. If you are interested, please email me and we can chat. PS - We're planning to do a more thorough CA trip later [read: southern and central CA] and then something of a national trip in fall. We'll keep you posted when we start thinking about that. I have turned 30. Thanks to all of you for your kind and encouraging words. I draw strength and direction from them...seriously. I am ready to start this book. I was holding off to finish a few other books so that I can really devote myself to this book. I tend to consume ideas in unhealthy ways sometimes, so I wanted to be a bit more single-minded in my intake. This book marks my "reading one book at a time" strategy. We'll see if it's helpful. 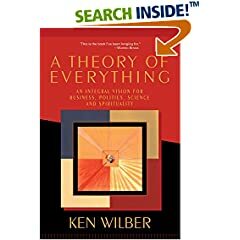 So, the book I am talking about is called A Theory of Everything by Ken Wilbur. I have read the first couple chapters earlier in 2006...and am now ready to really dive into the book. He proposes that there is a great unifying theory beyond mere string theory. His search is for a unified theory that includes all things, not merely the physical. This has been a quest of mine for years and years...and he is not offering THE unifying theory, but rather A unifying theory. I can appreciate that. I'll post some thoughts along the way for those interested. Cheers friends. I feel like I'm continually caught in a sort of permanent cobalt season, sandwiched between the dark of night and the bright light of morning. My eyes are still trying to adjust to see my surroundings. I wrote those words in Belgium last Spring. I feel that I am in a constant transition period. And the longer this goes on, I notice that there are a great many others in this same state. I have friends all over the US that are leaving their careers to start down a different path. I know so many who have risked to do good, forged new ground, re-imagined their world for themselves and others, given of themselves selflessly. And so many of these experiments in truth have left them tired, sometimes feeling abandoned...and it leaves me wondering how the Universe can have goodness at it's core. I have often heard that cynics are failed idealists. I can understand this because I tend towards cynicism these days. I am not critical of the church because I hate it; I am critical of it because I attempted to help ideals be realized within it and it collapsed on me. In fact, most things I am cynical about are things I have tried to "help" as I saw fit. Still, I know others who have played it safe and are making bank...economically, emotionally, etc. What gives?!? I read recently that as we risk and seek to do good, God parts ways for us and in fact teems with us. I don't know. Then yesterday I read in Matthew where Jesus said that you're blessed when others persecute you because you follow me. I feel like this is a much truer statement. Sorry if this seems a bit downer, but I am carrying a heavy load of many people's burdens...not because they have asked me to, but because I feel people's struggle very deeply. It seems that there is so much hardship that I am aware of these days. I wonder if this is going anywhere sometimes. I wonder if we will all just try to survive until we die and others come along and try the same. Or if there is some light ahead. It might sound over-the-top to say, but I have often wondered what good God is when things get like this. I just finished this book, which was loaned to me by a good friend out east. Wow. What a helpful book. That friend did his own review months ago here. Peter Rollins, a pastor-prophet-sort in Northern Ireland, sets forth to discuss some pretty involved theological-philosophical points concerning the Emerging Church Movement. He helps construct a worldview that is neither liberal, nor conservative. He holds tension between several seemingly adverse points of view...and it is quite refreshing and challenging. We ought to affirm our view of God while at the same time realizing that that view is inadequate. Hence we act both as theist and atheist. This a/theism is not some agnostic middle point hovering hesitantly between theism and atheism but, rather, actively embraces both out of a profound faith. He goes on to explain that we must hold our views of God (and our communities' and traditions' views of God) in constant criticism and subject them to constant re-evaluation. I think this is the strongest book on Emerging Church philosophy/theology to date. He has razor-sharp precision and has created a 75-page manifesto (Part 1 of the book) that has no spare words. The second part is helpful as well...a description of several of Ikon's (their faith community) services that correlate to the material. I was a bit skeptical at first and thought I'd only read Part 1, but ended up finding Part 2 really helpful as well. I recommend reading the whole book. 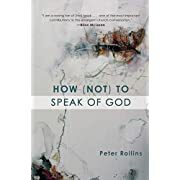 For those outside of the whole Emerging conversation, this is a great primer from a theological-philosophical standpoint...a great entry point. And for those who have contributed to and participated in different things Emergent, this is a great book to clarify some of the things "at the center" of this whole conversation.